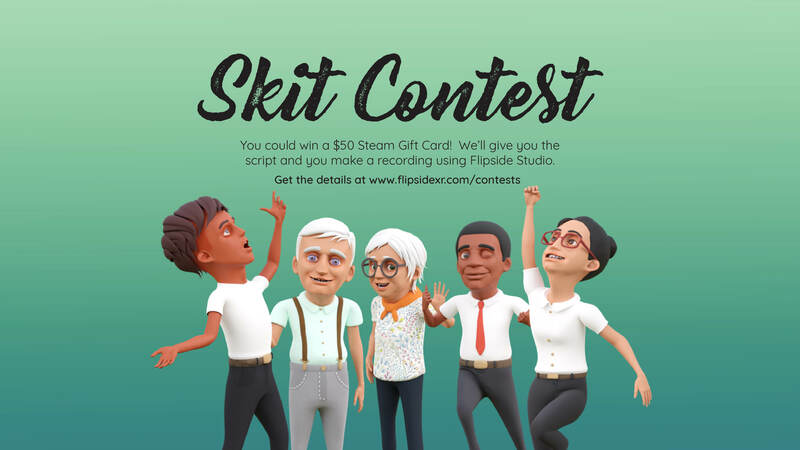 We're having our first Flipside contest! You could win a $50 Steam Gift Card. We’ll give you the script and you make a recording using Flipside Studio. Record a show using one of the scripts provided. Get creative! Share your show in the #share-your-creations channel on the Flipside Discord chat. Make sure to title your video "Flipside - Contest #1 Submission" and also specify the relevant recording name (take #) in your Recordings palette (we want to check it out in VR too!). Submissions are due by end of day (11:59PM CST) on June 30th, 2018. Wait for the winner to be announced on July 6th, 2018. Congratulations to Dorothy Jean Thompson! Check out her submission below. If you can’t find the info you need on our support page, send us a message. If you are already a Flipside creator and have a feature request or feedback, please submit it through the Creator Community. Message Please enter a message for us.